I feel like I’m too busy [blogging] history to read it. I’m not a MOOC completer. I am zero for life. My longest duration has been maybe 2 weeks, and more typically, much less. I am not denying that others get value of them and develop rich connective experiences. But I find the recipe structure and the activity behind a login as lifeless as the job of observing paint drying. Why must all courses be so– “course-y”? Perhaps one day I will meet the right one. One exception that has been pointed out to me is ModPo or Modern Poetry that seems to defy the bore factor and exists in parts outside the MOOC box. I think that’s the one I stayed in the longest. Maybe I am just a crappy student. Kate Bowles told me about The Active Citizen in the Digital Age; she said the NovoEd platform was worthwhile for it’s use of small groups. I was truly interested, I swear! After co-teaching an open course (not a MOOC) with Mia Zamora in Networked Narratives where we had students engage in issues and use tools on the web to communicate, express, network… well I thought I could learn more for the next time. The course is offered by Stanford, you know the place where some believe MOOCs were invented (Canadians get no respect). There is a highly polished intro video with the two profs [at Stanford], starting with the flyover of the Stanford Campus, moving upbeat music, and voiceovers over photos of people [Not at Stanford] doing activism. And then it’s the structure. Little modules. Sequenced logically. Start with 3 objectives. Watch a video of people telling me stuff I can read. An article to read. An assignment to say something in a forum. What are the actions you take today in the three sectors of democracy (politics, the marketplace and civil society) to achieve impact in the issues you care about? You have three options for submission. (1) Create a Powerpoint with images, or (2) record a brief video of up to 3 minutes, or (3) write a few paragraphs that tells us about your actions in the three sectors. Okay, I did jump on the Powerpoint, especially because for week 2 they were shared as examples of quality work. 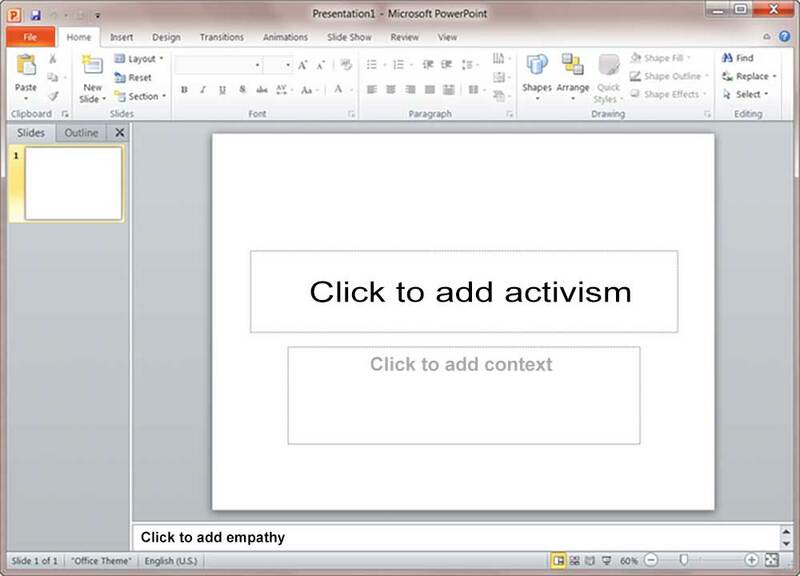 Please show me one place in the world people are exercising their activism online using freaking Powerpoint. The assignment for week 2 is to form teams. And write a Mission Statement for our team. Few phrases launch me more deeply into a coma than “mission statement” — those iceberg lettuce word salads where every ounce of humanity is squeezed out, swept away. At the same time I am not keeping up with the MOOC, I am deeply engrossed in reading Zeynep Tufekci’s Twitter and Tear Gas with her direct experience participating in the Mexican Zapatista uprisings in, Arab Spring, the Occupy Movement, and the protests in her home country of Turkey in Gezi Park. These young people had indeed thought about the project one day and started it the nest. The details of what they wanted to do were vague; turn social media into a platform for journalism, break the censorship they knew dominated mass media, and become intermediaries for the public. They did not know what the result would be, or that it would turn out to play a crucial role. With all the digital technologies at their disposal, they could start building, and ask questions later. Well maybe once they checked off their course objectives. On a rubric. The revolution will not be Powerpointed. I find most courses, also academic presentations ignore the basic tenants of film and storytelling to lead strong, to hook people in, and to take them on a story shape of a journey where the end is not revealed at the start. We are living right now in a momentous, disturbing, maybe even social destructive time of upheaval; how can you not lead with what is going on all around us? There is activism and suppression happening every day, but instead, lead with more or less on the three sectors of democracy. And this is an example of teaching on the web, using that beautiful HTTP protocal as simply a delivery mechanism. Keep stuff behind the login. Do not venture out and use the platforms and media where digital activism is happening. I am most certainly being judgemental, but I cannot be part of such a cloistered, bubbled experience. I cannot see any relevance to what is happening right now in this *****ed up world. In Networked Narratives we did not make civic activism an overt goal, in fact we wanted to have our students create web media and narratives, alternative truths, exploring/creating identity, having open networked experiences, so that, when their awareness get more awakened, they have some tools and skills at hands to do something. More than creating memes and gifs and twitter bots for the laughs, but for a purpose. Their purpose. We’d never do group mission statements. We’d do hashtags. We’d define a meme image to represent us. We’d develop code language for covert communication on open channels. We had no budget beyond Mia’s role as a professor and the meager amounts I get for being adjunct. I splurged $35 on a vanity domain and hosted it on my own Reclaim Hosting account. We used free open blogs, annotation tools, media tools. Our “high end” video production was using Google Hangouts to record and my own goofy editing in iMovie. Our students created memes, gifs, explored bots, learned code ciphers, annotated readings, they visited narrative experts in their place of creativity and conversed on issues with others in Mexico, Vermont, Australia, and Egypt. Our course videos were ‘hacked’ by mysterious entities who turned out to be interested in our fate. We more or less ran TeachProv every week. Students created alternative personalities, gave them voice with twitter bots, explored problems of the Pepsi ad and Slacktivism. I’m by no means trying to say our course is any better. I am not sure we really “taught” anyone the underpinning theory of activism. But what we did exists and lives in the open web, not just on it, not hidden behind a login. We did this in the places where digital activism happens. We did stuff. And it was not Powerpoint. Not mission statements. The digital Revolution, it will not be Powerpointed, and you will not understand it inside the glass bubble of a MOOC. Featured Image: Generic screenshot of Powerpoint editor with a little bit of re-writing the template placeholders. Very questionable rights to attribute. Do I stretch the invocation of fair use (remix for parody) or just go WTFPL? Thanks Sheila for the window into #creativeHE – a lot of activity there, and I like how there are so many wide ranging responses to the prompts. It’s quite like the DS106 Daily Create now in it’s 6th year. And yes, I love the Will Self clip – that idea that school has aimed to become like the workplace if the 1980s is a sharp one. Both are going to be useful for some work I am doing in November, creativity in the workplace stuff. As always, insightful. And hope to snag you a bit this summer with feedback, ideas on My Community idea. As to our, as in https://youngwritersproject.org involvement with #netnarr it was surprising and real. All good qualities in life. We learned and changed. Thank you, Mia and your students. Great job. And thoughtful blog. I definitely dropped the no. It’s a good thing there’s a sharped eyed newspaper man out there. Great and funny post! Learning is an adventure, yes. Powerpoint and mission statements are not. Great post, Alan. I received my notice that I had not completed assignment 1 for The Active Citizen earlier this week. I too am finding it hard to stay engaged. I am going to continue to go back and see what/who is there, but I did realize something about myself this MOOC round. Closed spaces for groups of people who already know each other to some degree make sense. Closed groups of lots of people I do not know feels awkward. Like you have to recreate an identity for that space, when you’ve already done that in other spaces. Shouldn’t these learning spaces allow us to connect to our already formed identities or starting building something that we would use later? Good question, Sundi. I am not so sure it’s absolute, or whether closed/open makes the difference. This course to me missed the opportunity to start with a compelling hook, a story, a motivation, or any kind of activity (besides “introduce yourselves”) that would make me want to meet people I don’t know. It started with definitions. It started with definitions. That is not a call on a Hero’s Journey path. That was awesome, Alan, I enjoyed this post so mucho! “Few phrases launch me more deeply into a coma than “mission statement” — I’ll use that quote. And that not-so-I-AI video? Anyhow, is Tufekci’s book worth? Yo recommend it? I’m still in first chapter of Zeynep’s book, but I’m finding it worthy as a more than cursory look at these real activism stories. An ancient lesson we always need to learn: bad storytelling doesn’t engage. 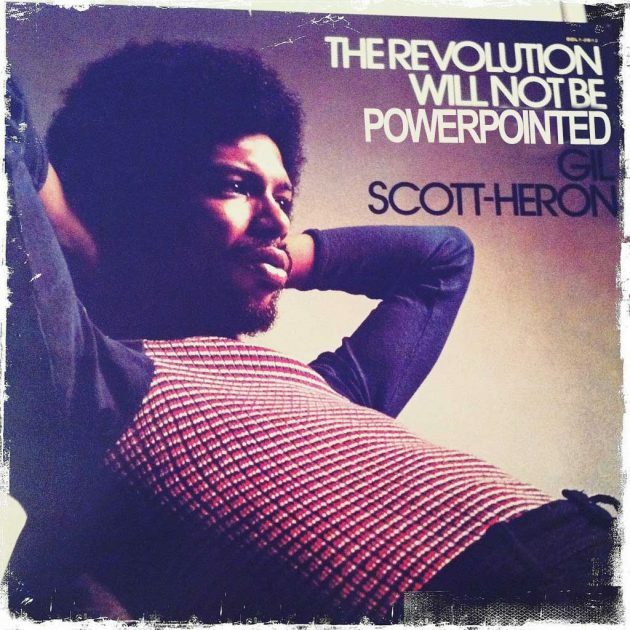 Good points about where activism is now. Video, social media, creative work – this is what education should be teaching.